With the rise of hacker groups like “Anonymous,” coupled with the damage to Iran’s nuclear reactors left in the wake of the Stuxnet worm, 2012 has been coined the “Year of Cyber Security” by various media outlets. However, as the global community embarks upon what appears to be the epicenter of the Internet Age, privacy rights and freedom of speech on the internet creates tension with government domestic and national security and economic interests. Years before the advent of the internet, The United States Supreme Court cautioned in Keith the potential for a government to undermine the right to privacy inherent in the Bill of Rights through the unabated use of electronic surveillance in the name of “domestic security.” Nearly four decades later and half-way across the globe, the Syrian Government has brought the fears of the Court to life; in an attempt to quell the recent uprising against the current political regime, the Syrian Government has begun blocking and intercepting text message communications between demonstration organizers and participants. The Syrian government, using spyware technology, issued orders to block all text messages containing terms such as “revolution” or “demonstration.” While this spyware technology is designed for protecting networks against spam and viruses, this same technology provides political regimes the ability to intercept their citizens’ e-mails and text messages, monitor Internet activity, and locate political targets. The orders from the Syrian Government are being carried out by the two of the largest mobile networks in the country, Syriatel and MTN Syria, using software provided by Dublin-based Cellusys and AdaptiveMobile. While AdaptiveMobile has yet to issue an official comment on the situation in Syria, AdaptiveMobile said in a statement that, in 2008, it provided MTN Syria with a standard SMS spam and MMS antivirus product for blocking spam, viruses, and inappropriate content. However, “given the changing political situation in the region”, AdaptiveMobile did not renew the contract with MTN Syria last year. Cellusys claims to have not sent workers to the country since 2009 and remains unaware of how its technology is being used today. Despite the use of European technology by the current Syrian political regime to repress demonstrators, the supply of the software to MTN Syria and Syriatel did not violate any Irish or European laws: the transactions occurred prior to the 2011 EU imposed restrictions on sales of equipment to Syria that could be used for repression. The news from Syria comes in the wake of the Arab Spring. 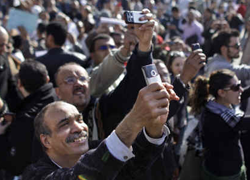 Still fresh a year later in the minds of persons the world over, the use of Twitter, Facebook and text messaging were integral to organizing the revolutions and demonstrations that toppled autocratic regimes in Tunisia, Egypt and Libya. Through intercepting the private text messages and online communications of its citizens, the Syrian Government goes beyond just containing anti-regime sentiment and violates an often forgotten human right in today’s Facebook-addicted society: privacy. As the international community begins to confront and monitor hacker groups like “Anonymous” in the name of domestic security, we must remember Syria’s censorship and interception in the private conversations of its citizens in the years to come.